Located north from Malé, within the constellation of islands that form the Noonu Atoll, Velaa Private Island opens Q4 2013, bringing new meaning to “private moments” in the Maldives. Here the essence of Maldivian culture, lifestyle and landscape meets limitless opportunities, where no request is too much, and each guest will ultimately feel that this is their own private island. Born out of a desire for a resort that provides both privacy and variety, founders Radka and Jiri Smejc have created Velaa Private Island after years of travelling extensively to the Maldives. Passionate about the hospitality business, the Smejcs sought to bring something new and special to the Maldives, aiming to be the best in class by providing a service culture that goes beyond hospitality boundaries. Partnering with My Blend By Clarins, Velaa will count itself one of only a handful of hotels in the world to be working alongside this distinguished brand and will feature exclusive My Blend facial products and body treatments by Clarins for a truly personalised experience. Velaa Private Island has also established a partnership with Michelin star acclaimed Chef Adeline Grattard from Paris. Adeline will oversee the resort’s signature restaurant Aragu and Cru as well as Tavaru and the Breakfast Experience. A blend of French and Asian cuisine, supplemented by fresh local produce and the resort’s private herb garden, is being created specifically by Adeline for Velaa Private Island. Golf enthusiasts will be treated to the only Troon Short Game Golf Academy in the Maldives. Designed by professional golfer and two-­‐time Masters champion Jose Maria Olazabal, golfers can craft their game in the middle of paradise. Velaa shares its name and its home with the generations of sea turtles that have inhabited the island for countless years. The colours and patterns of a turtle shell make up subtle nuances in the design, while from a broader aerial view Velaa’s exclusive over-­‐water villas resemble the head of a turtle with the island forming the body. Designed by Czech architect Petr Kolar, the overall design concept is contemporary, yet intimate, with Maldivian nuances. Comprising 43 private villas and five four-­‐bedroom residences fusing local materials and contemporary flourishes, each private retreat offers a generous outdoor space and private pool. While 18 of the 43 villas are built over water, the Romantic Villa is the only exclusive villa that is reached by boat. 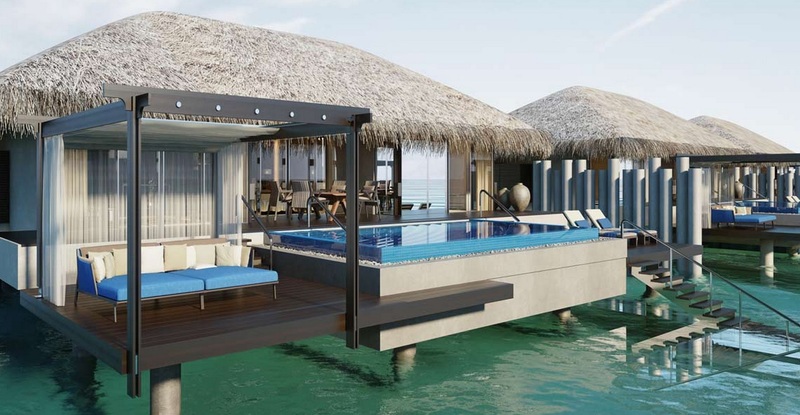 The Velaa Private Residences are the only 4-­‐bedroom residences in the Maldives offering elegant contemporary design and 1,350 square metres of private interior and exterior space, inclusive of two terraces, a pool and a courtyard. Accommodating up to ten people, these residences grant a new level of luxury travel in the Maldives for friends and families alike. The spa, in addition to featuring exclusive My Blend by Clarins products and treatments, will showcase the first ‘snow room’ in the Maldives and comprises six secluded treatment rooms nestled over the island’s turquoise lagoon. A cloud-­‐shaped reclining treatment pod by Klafs and Sha will also be featured in the spa, which slowly sway and cradle guests into deep relaxation. A Yoga Pavilion is available for sessions with a yoga master and personal training programmes can also be held on the raised-­‐tree meditation platform in the garden or by the beach. Velaa Private Island’s gym features world-­‐class fitness equipment in addition to covered tennis and squash courts, a football field and beach volleyball court. For the epicurean, Velaa Private Island boasts the culinary consultancy of Michelin-­‐star chef Adeline Grattard from Paris. With three restaurants and two bars and 1 wine cellar, every palate is sure to be satisfied. Velaa Private Island’s signature restaurant, Aragu and Cru, serves innovative cuisine in an elegant setting over water; here guests can enjoy vintage champagne at Cru followed by fine dining. Tavaru houses a Teppanyaki restaurant and makes up the centerpiece of the island: a visually striking ivory-­‐white tower where live cooking and Velaa’s extensive wine cellar take centre stage. Athiri is beachfront all-­‐day dining at its finest, where guests can enjoy a buffet breakfast and an à la carte menu throughout the day; and Avi is a befitting pool bar by day and vibrant cocktail bar by night. Finally Destination Dining offers guests a variety of stylish and distinctly different settings, both on and off the island, with bespoke menus and entertainment to suit special occasions. In-­‐villa dining allows guests privacy and personal space around the clock with “Quick Option” and “Served in Room” menus available to all guests. A dive centre offers excursions, certification courses and the chance to snorkel over breathtaking marine vistas. Water activities on offer include: windsurfing, kayaking, sailing, wakeboarding, water-­‐skiing and kitesurfing, while the truly adventurous can take part in an exclusive semi-­‐submarine expedition. Additionally, the excursions team is on-­‐hand to guide guests in fishing techniques as the deep, cool waters of the Noonu Atoll are home to a vast array of fish species. Sunset cruises, dolphin watching and private boat excursions can all be arranged for guests on board the luxury Prestige yacht or the custom-­‐built traditional ‘Bahtheli’ boat. Velaa Private Island opens Q4 2013.